While rice is cooking, heat oven to 350°F. Cut bell peppers in half lengthwise; remove seeds. Cook in boiling water 3 minutes. Remove from boiling water; drain well. Place peppers in ungreased 12x8-inch (2-quart) baking dish. In medium bowl, combine cooked rice, chili beans and onions. Fill pepper halves with rice mixture. In small bowl, combine tomato sauce, basil and garlic; blend well. Pour over filled peppers. Cover with foil; bake at 350°F. for 30 to 35 minutes or until thoroughly heated. 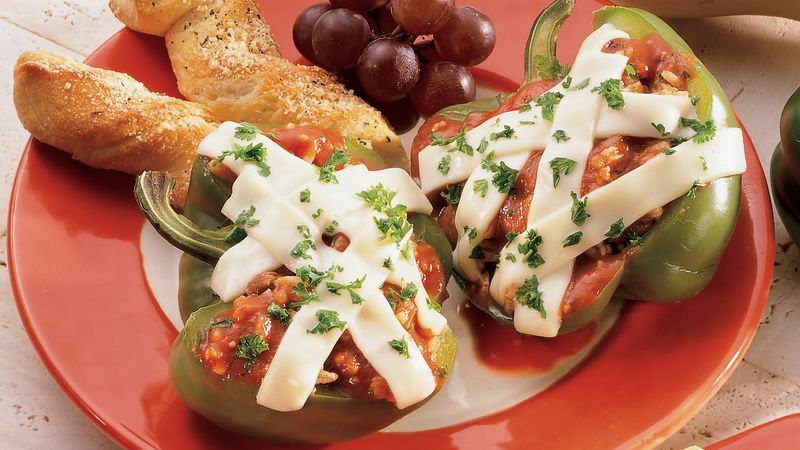 Place cheese strips over peppers; bake uncovered for an additional 5 minutes or until cheese is melted. Sprinkle with chopped parsley. Monterey Jack or mild Cheddar cheese can be used in place of the provolone cheese. Sweet peppers, such as green bell peppers, are a good source of vitamin C and a good source of beta-carotene, which is converted in the body into vitamin A. Stuff the peppers one day ahead. Cover and refrigerate. To bake, pour the tomato sauce over the peppers and continue as directed in the recipe.